Having an excellent furniture library is critical for any architectural visualization artist, and it will enable you to fill a project with many significant assets quickly. Most of the assets you will find in free libraries have either low quality or doesnâ€™t offer a wide variety of options. For instance, you will most likely get furniture models for residential projects. When you have the opportunity to download a furniture model for something like an office, you should immediately take action! 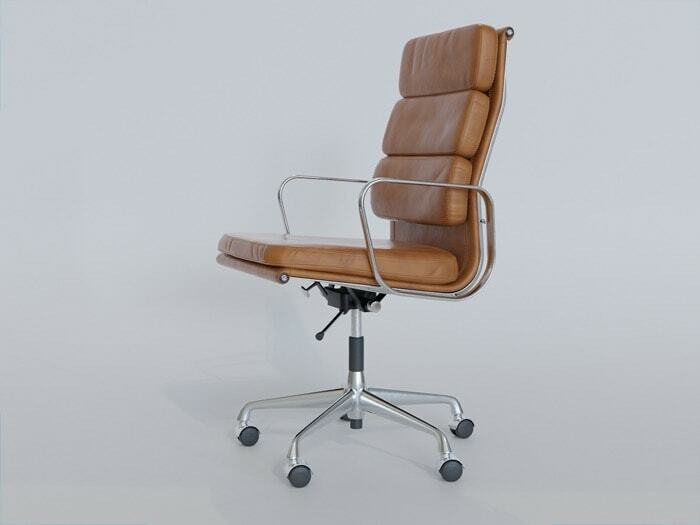 Do you want to download a free office chair model? The author of this model is an artist called Laci Lacko, which posted the file on his Behance page. Despite being a great furniture model to use in office interiors, you will also find that this particular model has a high level of detail. With a polygon count of about 650k faces, you will get great renders with the camera close to the object. What about the file format? You can download the file in OBJ and use it in almost any 3D software. By the way, if you look to the description and realtime provided by the artist, you will find that he used Blender 2.8. To get the file, you will have to use a shared link from the artists personal Google Drive. It will provide a fast and reliable download, but it could become unavailable at any moment. If you want to get the free Charles & Ray Eames office chair, download it as soon as possible. If you want to get more free office furniture, you should take a look into this office set compatible with Blender.